Israeli Prime Minister, Benjamin Netanyahu, rebuked Israeli opposition leader, Tzipi Livni, for holding a meeting with Palestinian President, Mahmoud Abbas, in Jordanian capital, Amman.Livni phoned Netanyahu to inform him on the details of the meeting, that was not sanctioned by the Israeli government, but he rebuked her for holding the meeting. Israeli Radio reported that Netanyahu told Livni that “if the Palestinians want peace, they should hold negotiations with the elected government in Israel”. 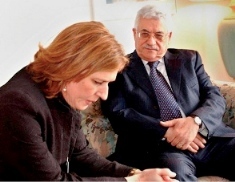 The Palestine Today news agency reported that the Kadima opposition Party, headed by Livni, said in a press release that she informed Netanyahu that Israel needs to do whatever it can to ensure the resumption of immediate and direct peace talks with the Palestinian side. She also told Netanyahu that the security situation in Israel requires it to enter serious talks with the Palestinians, supported by the international community “instead of pushing Israel towards isolation”. Livni added that she is not trying to present herself as an alternative to the Israeli government in talks with the Palestinians, adding that she is merely trying to remove Israel from its current state of international isolation. Netanyahu was planning to meet Livni but voided the meeting after details of the phone conversation reached the media, and were published in a press release issued by the Kadima Party.